We’ve already had one Schadenfreude puzzle this year. Back in January there were the prime numbered presidents. My first thoughts with one of his puzzles is whether it’s going to be an easy-ish one or a bit more tricky-ish. I’m not giving too much away to say that it was middle-of-the-road-ish. An extra word appeared in every clue. Those sharing one letter in common with their answer gave X using those letters. The others, using second and penultimate letters, gave what needed changing and what was to be revealed. The four unclued entries one cell in from the perimeter would provide the definition of Y which would also help to give Z. All this turned out to be good fun, and the surface readings of the clues were amusing, given some entertaining extra words. We had a plucky European, an upright catholic, a diffident Italian, a swarthy earl, a rich sweetheart and, much to Shirley’s delight I’m sure, a boozy officer! The definition of Y was DECLINED THE OPTION OF OPENING THE BETTING. The single letters provided by the clues gave cruciverbal and what needed changing and the resultant revelation was Five letters and Two word phrase in which Zs exist. The form the definition of Y traced was obviously a square, and I was lucky to guess at “checked” for Y since I hadn’t come across that meaning before. It didn’t take long to see CROSSW in column 4 and thus change three letters to give CROSSWORD. I now wondered whether the “in which Zs exist” might be deviously guiding us towards PUZZLE as the second word, but, given that we could only change two more letters, it soon became clear that PUZZLE was impossible. 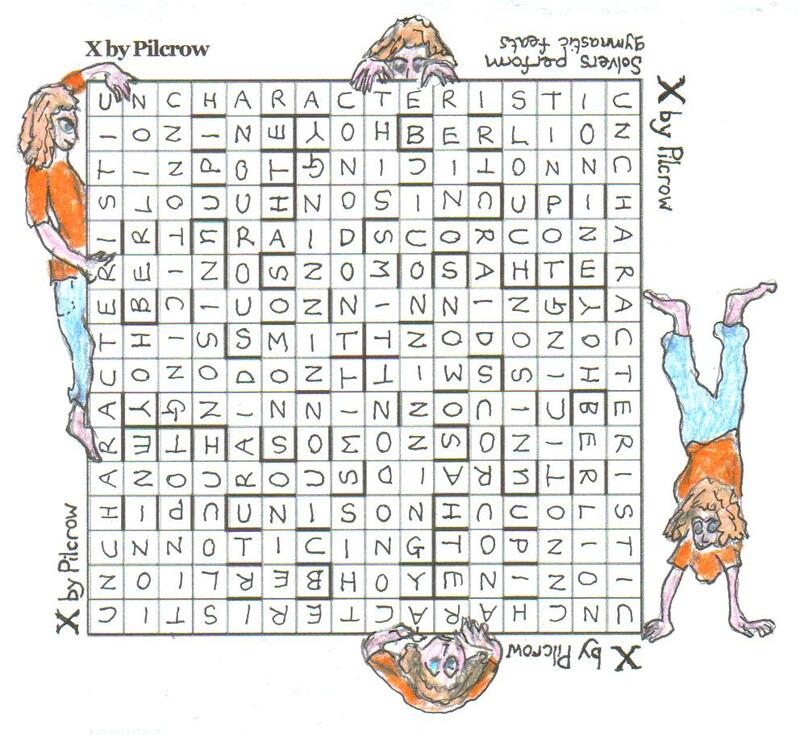 GRID, however, was possible in row 10 and a crossword grid certainly, in the UK at least, has checked squares. Thanks to Schadenfreude for another imaginative crossword showing how almost anything can become cruciverbal fodder. 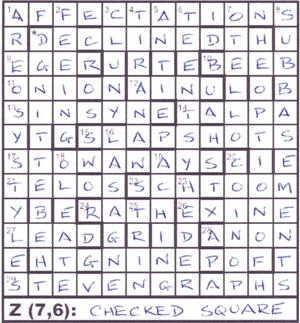 The preamble gives us lots of information but we can make no early guesses about what X, Y and Z are going to be, though we see that we have a ten by ten square within our grid that is going to contain a definition that, together with its form will give us the two-word phrase (7,6) that we will write below the grid. It’s going to be a long definition – 36 letters – and it does appear in Chambers. Nothing to do but solve! Well, yes, of course I confirm that Schadenfreude still qualifies for entry to the Listener Oenophile Club and find ‘Head of Ulster avoided getting drunk (5)’ I work backwards from ONION for that and use O’ + NI + ON, so ‘avoided’ has to be the helpful extra word and that shares and O and an I with ONION, so gives me a second and a penultimate letter VE. (and he didn’t avoid ‘getting drunk’ so we are well into the alcohol already. Burgundy appears next, ‘Ham-fisted islander loses a thousand somewhere in Burgundy (5)’ We live just south of Burgundy and get fine wines. Schadenfreude’s doing fine now! We take a thousand (K) from CLUNKY and get CLUNY. (and that gives us the SE of ‘islander’ as part of our instructive message). He’s not finished with the alcohol yet! ‘Reprehensible soldiers close to midnight occupying boozy officer’s cellars (12)’. We put BASE MEN and (midnigh)T into SUBS giving SUBBASEMENTS, happily producing one of those generous 12-letter solutions, and say ‘Cheers!’ to Schadenfreude down in those wine cellars, even if we had to extract ‘boozy’ from the clue, giving a B.
Schadenfreude gave us a fine set of clues (Well, he would, wouldn’t he?) and with the help of TEA we soon had the grid surrounded by AREOSYSTYLES, AFFECTATIONS and STEVENGRAPHS (I can’t see myself introducing some of those into dinner table conversation!) and we were able to add a few letters to those that were appearing and work out that X was CRUCIVERBAL. The instructions about what we must change after filling the grid, and ‘what that will reveal’ took a little longer, partly because of that intriguing HZ SE XI ST that appeared in the last four clues – some form of p.c. statement? No, it turned out to be FIVE LETTERS that had to be changed, and TWO WORD PHRASE IN WHICH Zs EXIST. A full grid and a bit of a head-scratcher trying to make sense of the letters we had in that 10 X 10 square – there was a bit of Numpty muttering before we learned that CHECKED in Chambers, gives DECLINED THE OPTION OF OPENING THE BETTING. What was left to do? Find that two-word phrase in the grid that was ‘where checked squares exist’ but the phrase had not to use any checked squares. Clever word play! That, of course, led me to those unchecked letters, reading down the grid and across – CROSSWORD GRID. All fitting together thematically. Thank you Schadenfreude. Only seventeen clues. Now that looked promising for the ‘Stripey Horse (5) Z??? ?’ team, especially as the misprints seemed likely to yield something recognisable (piece for niece, mark for mask, incite for invite, slump for slurp and person for parson). However, it was the misprints that took us the longest. We almost despaired of finding the definition of X. Clearly, as there were 68 slots in the grid and a perfectly rotational symmetry in the grid construction, words were going to be entered four times each. Even the stripey horse gang could see that. But which words and how? As soon as we had ‘perfect symmetry’, we were away and solutions began to appear. SMIT, UNNOTICING, HOY, TIN GOD, REIN, SLOUCH. This was sheer joy, as, clearly, every solved clue counted for four – if we could fit it in! It was those words ‘in clue order’ that gave the game away. Feeding UNNOTICED into the grid in the obvious place, which had to be after at least one four-letter word (SMIT) and probably in the across clues – therefore three lines from the ‘bottom’, gave us the direction in which that word had to go four times. Wonderful! The only problem was that when we entered all the words we had by now solved (tailless ANOUROUS had crawled in), we had an impossible sixteen-letter word in the perimeter. Intriguingly, VITTORIO EMMANUEL fitted if we fed him in backwards; but he didn’t have much to do with an extraordinary personality to get moving about. It made sense to look for an N or a C in the four corners, and light dawned. ‘Extraordinary’ gave UNCHARACTERISTIC. From there on, it was downhill all the way (which boded well as heavy snow was falling outside) – sheer magic. Probably because of Pilcrow’s astonishing feat of compiling this grid with perfect rotational symmetry, the solutions simply fell into place. It was now simply a matter of dizzily rotating the grid to fit it all in, or performing acrobatic feats round the grid. No red herrings? You must be joking! It wasn’t until I was copying out my grid and imposing strict ‘clue order’, that I realized that the odd word NOSING should not really be appearing before SMIT. I hadn’t understood the word-play but fondly imagined it had something to do with handling first class reds (nosing the red wine!) Of course, turned upside down, it gave a far more satisfactory UNISON, and the ‘clergyman handling first class rode on the Tay’ gave the missing RAID. We loved this one and really admired the astonishing construction – down to that penultimate word SNOW (which, by 2 a.m. when I finished solving, was a foot deep outside the window).